We wish to honor the brave men and women who have served and defended our country with courage and commitment. 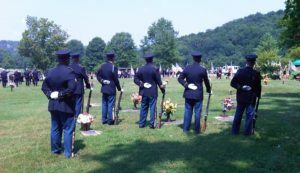 Our American Hero Service Plans offer all veterans a free cemetery space and 5% savings on all funeral services, cremations with service (excluding direct cremation), all caskets over $2300 and outer burial containers. For members of a registered Veteran Service Organization, this discount is extended to a 10% savings. With all services you receive a wooden flag case, lapel pins for guests, service medallions on the funeral coach and a custom printed stationary package. Ask one of our representatives if the service organization you are a member of is on our list. Discounts are honored both at the time of need and for prearrangements. Discounts may not be used in combination with any other discounts. DD-214 is required. 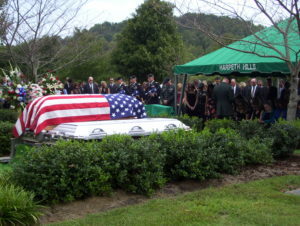 At the time of a veteran’s death, if the family chooses cremation, permission will be sought for an unusable flag to drape that veteran for disposal in the most dignified manner. Upon receipt of the cremated remains of their veteran, the family will receive a certificate stating the last deed of service for that flag was to drape their veteran in the cremation process. Unusable flags may be donated to the funeral home any day of the week. Every life has a story…We honor each one.